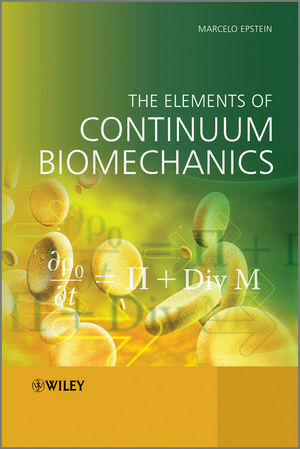 This book presents the elements of Continuum Mechanics to people interested in applications to biological systems. It is divided into two parts, the first of which introduces the basic concepts within a strictly one-dimensional spatial context. This policy has been adopted so as to allow the newcomer to Continuum Mechanics to appreciate how the theory can be applied to important issues in Biomechanics from the very beginning. These include mechanical and thermodynamical balance, materials with fading memory and chemically reacting mixtures. In the second part of the book, the fully fledged three-dimensional theory is presented and applied to hyperelasticity of soft tissue, and to theories of remodeling, aging and growth. The book closes with a chapter devoted to Finite Element analysis. These and other topics are illustrated with case studies motivated by biomedical applications, such as vibration of air in the air canal, hyperthermia treatment of tumours, striated muscle memory, biphasic model of cartilage and adaptive elasticity of bone. The book offers a challenging and appealing introduction to Continuum Mechanics for students and researchers of biomechanics, and other engineering and scientific disciplines. Moves from foundation topics, such as kinematics and balance laws, to more advanced areas such as theories of growth and the finite element method..
Marcelo Epstein is Professor of Mechanical and Manufacturing Engineering and Adjunct Professor of Kinesiology at the University of Calgary. He is a fellow of the American Academy of Mechanics, recipient of the CANCAM prize and University Professor of Rational Mechanics.